whether to update after version? You forgot Divine Protection! I don't see it where the Spell_Holy_Divine... spells are. It goes from "DivineIntervention" to "DivineProvidence", skipping over it. I checked a different icon pack and it had Divine Protection in between there. A fix would be appreciated. These icons are awesome. Thank you. Please correct this icon buff of this elixir. thanks in advance! All Icons are the 4.3 Icons I have redone all Icons from the 4.3 blizzard website. Those aren't located in the icons folder but in the buttons folder. how am I supposed to revert back to the default icons? The worst part was figuring out which icons didn't have an existing item/spell/achievement attached to them and thus were meaningless to add. That meant I threw out a ton of Firelands stuff (the icons might get changed anyway) and a ton of the new PVP tier, until they're actually in officially. I also threw out creature portraits since Quokka seems to have ignored them also originally, and I don't believe they're reused for other icons (I could be wrong). The zip file now has almost 200 icons in it! I now worship the word batch. If you find anything I've missed or anything that is an out-of-date graphic please do post! Because I'm sure stuff slipped between the cracks since my eyeballs fell out of my head doing this. Detailed changelog with icon names can be found here (now 5-6 times as boring!). Haha, that's what I thought too ish. In that case I'm probably going to just take the lazy way out and swap to that mod! Hey hey! You're absolutely right Jibroni, I noticed that as well for the first time on my mage when I switched out of frost spec. I was just too lazy to reupload a new zip file. Also I kind of thought people weren't actually using this addon anymore haha >.> Really really sorry for the late reply. I'll have a new version out soon with Flame Orb fixed and some new 4.2 icons. Umm does anyone actually really still want me to update this? >.> Cause Shadowkatt came out with a black pixel border icon pack and I was just wondering if people just want to switch to that, or if I should keep uploading stuff. edit: for now I uploaded the Flame Orb fix, but I'm going to wait till when 4.2 actually comes out to upload a new major version. The reason for that is also because I want to go through and make sure each icon matches up to the newest version of wow so everything's clean and tidy. For that reason a new release might take a while, but I promise it will happen. Last edited by fostic_popcorn : 06-23-11 at 12:58 PM. the flame orb icon is very strange looking! Last edited by fostic_popcorn : 04-28-11 at 02:12 PM. I've fallen in love with this addon and how it makes my UI look (especially when icons scale down), so I figured since Quokka seems to be on break I'd try to release a fan update. Fixed: Cataclysm gems, Volatile Life, Colossus Smash, Soulburn icons. (Based on posts since Quokka's last update). Download this zip file and extract it to the interface folder. 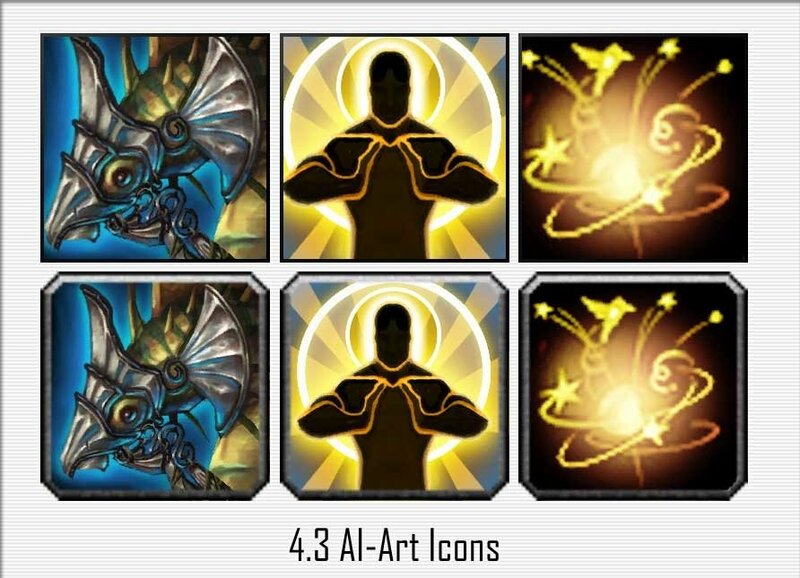 Do not delete your already existing ICONS folder, just extract this on top of AI-Art and have it replace icons that already exist. 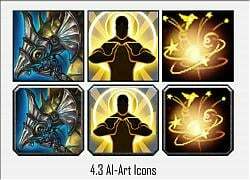 If you are new to this addon, download the original AI-Art Icons first and then download this "patch" (I guess you could call it). If you notice more icons that are wrong or missing please do post here! I'm sure I've missed stuff as I haven't had a real chance to play the 4.1 patch (finals ugh). And while I do have alts of all classes that I play semi-regularly, I'm not super in the "know" about what all class abilities should look like. The most important thing to include is the exact name of the item/spell/achievement that I can Wowhead and look up successfully. Please make sure it's correctly spelled too (for example I had some problems with finding Soulburn initially as the poster left a space in the middle and my lock alt is my least favorite). Other descriptions like "my gloves" gives me nothing to go on and I'm sorry Dave but I can't do that. EDIT: After doing some rudimentary digging apparently there's a lot more missing icons than just what has been posted (not even including 4.1 icons). Well crap I'm doing my research based off of the ever insanely-helpful Wowhead, but if anyone knows a better way I would appreciate the hell out of it. I have no idea how to compare folders or see if icons are missing or 'old' so I'm really relying on you users! Thanks! Last edited by fostic_popcorn : 04-28-11 at 10:13 AM.